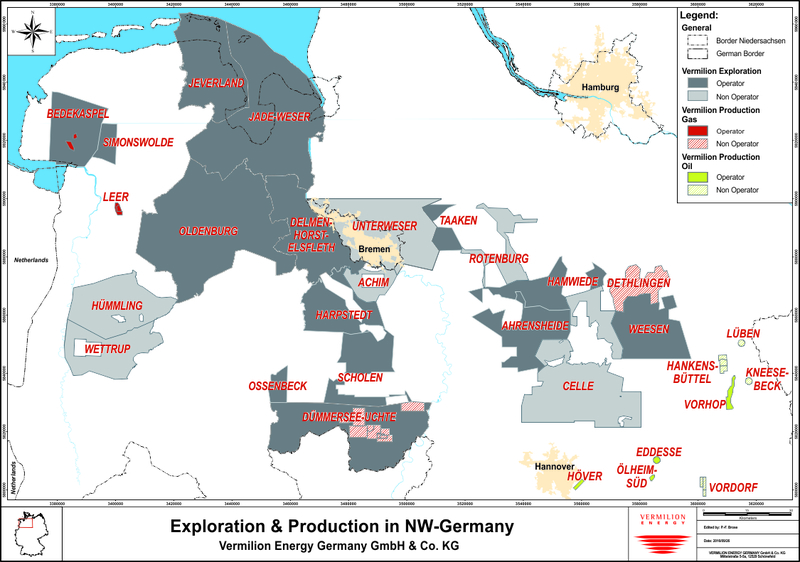 We hold a 25% interest in four producing gas fields spanning 11 production licenses as well as a proportionate interest in a surrounding exploration license, all in northwest Germany. The production and exploration licenses encompass approximately 20,000 net hectares (51,000 net acres) of which nearly 85% is in the exploration license. In addition, as a result of a farm-in agreement that Vermilion entered into in 2015 we hold participating interest in 19 onshore exploration licenses, comprising approximately 345,000 undeveloped net hectares (850,000 net acres) of oil and gas rights in northwest Germany. In exchange for this interest, Vermilion committed to the financial carry for the remaining 50% of the farmor’s interests in 11 gross (6 net) exploratory wells through 2020. Vermilion will assume operatorship for 11 of the licenses during the exploration phase representing about 60% of the total area included in the farm-in. All of Vermilion’s land holdings are within Lower Saxony which is the heartland of the German oil and gas industry.